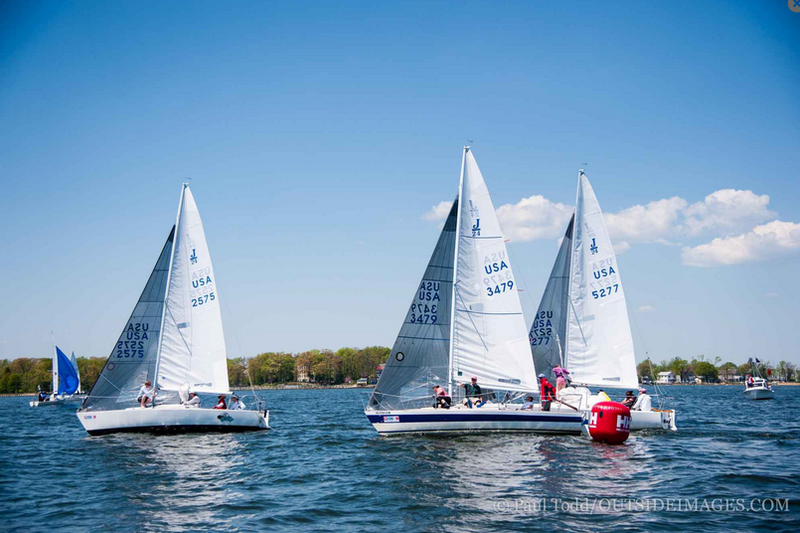 The weather this past weekend was gorgeous for the Annapolis NOOD, but gave competitors a run for their money with the variable wind conditions. Friday was relatively breezy, then Saturday brought very light air. The only race for the day was abandoned after the race committee shortened the J24 course to only two legs. The picture above shows very light air on Sunday, but enough to get in two races. Pat FitzGerald’s Rush Hour finished first overall with scores of 2, 2, 2, 2, 3, 2. Ron Medlin and Bash from South Carolina finished second, with Mark Rivera & J-Team taking the number three spot. Racing was incredibly tight in all of the races, with the lead switching often between boats. Next up is the Race to St. Michaels on Sat, May 23. Registration is open and we hope to see you out on the water!